Learn about customer experience trends impacting the utility industry. Read our brochures and white papers to see how VertexOne is upgrading the way utilities interact with their customers. Follow us on LinkedIn and Twitter to be the first to hear about new developments from VertexOne. 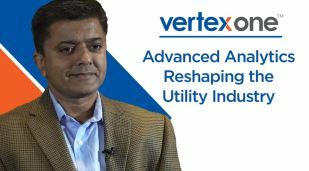 Chirag Shah Director of Analytics & Consulting at Vertex discusses how advanced analytics has transformed the utilities industry. Read the results of this Zpryme survey of 200 utilities regarding CIS readiness for changing customer and technology demands. This webinar addresses the top 3 concerns utilities have about cloud technology. Union Gas, who has been running in the cloud for over a decade, shares why the cloud works for them. Learn 3 important reasons why the cloud presents a better way for utilities to improve customer experience. Key findings in a survey of electric, gas and water utilities of all sizes. Upgrade customers to happier with anytime, anywhere self-service. Learn how to choose a CIS for the next 15 to 20 years. Our speakers share recent research on the top challenges and priorities in customer experience, plus stories that demonstrate how some utilities are addressing them. Learn the top advantages for utilities - from agility to TCO (total cost of ownership). Learn more about Predictive Analytics for Customer Enrollment. Learn more about Predictive Analytics for Debt Collection. Ready to upgrade your customers to happier?